Ten years after Sponsoring a bill to prevent legislators from becoming lobbyists right after leaving office, Governor Brown broke her own rule and hired former Representative Peter Buckley. Her spokesperson defended the hire, saying the “revolving door” law didn’t apply to her. Former state Rep. Peter Buckley left the Oregon Legislature this year and joined Brown’s office this week. When Oregon Gov. Kate Brown announced the hiring of former state Rep. Peter Buckley (D-Ashland) to advise her on long-term budgeting earlier this week, the move looked like a routine effort to beef up her staff. Buckley served in the House from 2005 until this January. And from 2008 until his departure, he was co-chair of the Joint Ways and Means Committee, which writes the state’s budget. But for a governor who has made restoring ethics to state government a centerpiece of her administration, Buckley’s hire presents a potential problem: State law may bar him from talking to legislators about the governor’s budget this year. That’s because of an ethics reform that Brown helped craft—and that her office now says doesn’t apply. Back in 2007, when she was Senate Majority Leader, Brown joined then-House Speaker Jeff Merkley (D-Portland) to pass an ethics reform bill that included a revolving door provision for ex-lawmakers. That provision prohibits former lawmakers from lobbying for one regular session after they’ve left office. So a retiring lawmaker such as Buckley could not lobby lawmakers on behalf of clients until after the current session ends sometime this summer. The Eugene Register-Guard first reported on Buckley’s problem this morning. A goal of the 2007 revolving door provision was to end the practice of ex-legislators immediately cashing in on the knowledge and relationships they’d acquired while in state service. But Chris Pair, Brown’s spokesman, says the prohibition doesn’t apply to Buckley because any communication he might have with lawmakers would be on the governor’s behalf. 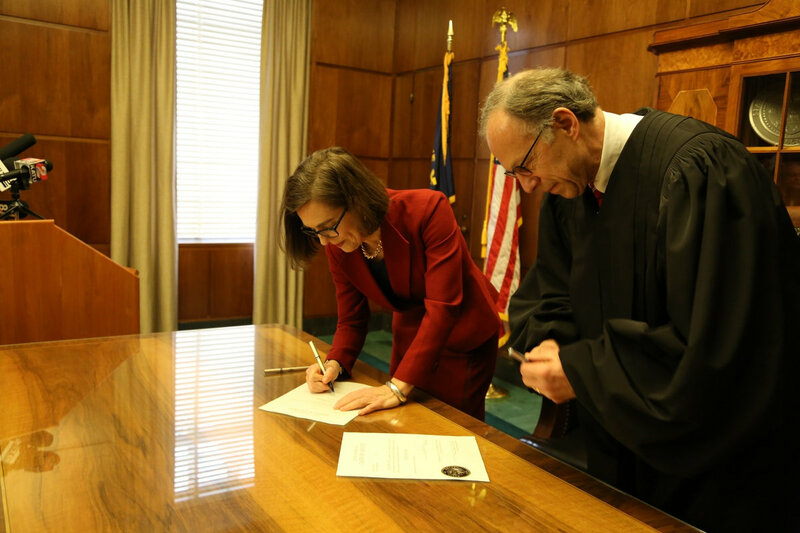 Pair points to a 2009 opinion from the Oregon Government Ethics Commission that said the prohibition on ex-lawmakers lobbying should not apply to former lawmakers elected to statewide office (such as Brown, who was elected Secretary of State in 2008). The idea would be that if they were acting in the state’s interest, their lobbying activity would not present an ethical conflict. There is a open question, however, about whether Buckley can communicate with or lobby his former colleagues. A March 9 opinion from the Legislature’s top lawyer, Legislative Counsel Dexter Johnson, first reported today by the Eugene Register Guard, says it appears he cannot. Senate Minority Leader Ted Ferrioli (R-John Day) said in a statement that based on the legislative counsel opinion, Buckley’s hire makes no sense. Pair says Brown’s expectation is that Buckley will be working on long-term structural fixes to future budgets, not to the current budget, and would therefore be communicating with other stakeholders around Oregon rather than with lawmakers. “The governor envisions he would be working with colleagues within the Executive branch on this work, and that he would not necessarily lobby legislators this session on budget-related issues,” Pair said. Things could be worse for Brown’s office: In 2011, the House considered a bill that would have imposed a blanket prohibition on former lawmakers taking state jobs within a year of leaving office. The concern, in part, was that lawmakers could spike their salaries and retirement benefits by moving from the Legislature into a high-paying state job. The bill passed the House unanimously—including an “aye” vote from then-Rep. Buckley. Fortunately for Buckley and Brown, that bill died in the Senate.